CIA Chief Pushes For More Spies Abroad; Surveillance Makes That Harder CIA Director Gina Haspel wants more undercover officers overseas. But in an age of universal surveillance, instant online searches and social media profiles, staying below the radar is a challenge. 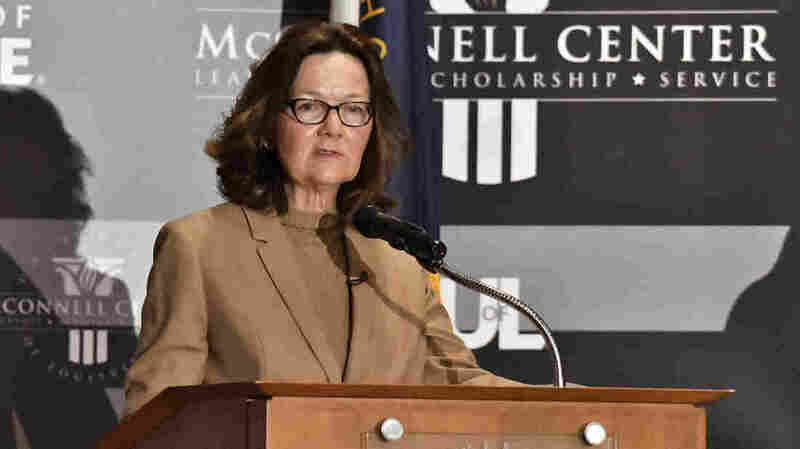 CIA Director Gina Haspel, speaking at the University of Louisville in September, says she wants to send more undercover officers overseas. Many in the intelligence world says this has become more challenging in an era of universal surveillance. But doing this isn't easy. It's always been a challenge to protect the identity of American spies and the foreign sources they work with, said Jonna Mendez, who used to be the chief of disguise at the CIA. "We would de-Americanize you," said Mendez, author of the forthcoming book The Moscow Rules, about the work she and her husband, fellow CIA officer Tony Mendez, did during the Soviet era. Jonna Mendez, the former chief of disguise at the CIA, explains how to hide one's identity. She offered up a few tips to an American trying to blend in with Europeans. "They wear their wedding rings on different fingers," Mendez said. "They eat differently than we do. They don't shuttle that fork back and forth." Just walking down the street can be a giveaway. "They think that we are slouchy, a little sloppy, and they think they can almost see that in our demeanor on the street. Because they stand up straight, they don't lean on things," said Mendez, who's on the advisory board of the International Spy Museum in Washington. "They are on two feet and we're always on one foot with that other foot kind of stuck out." Retired CIA officer John Sipher said it wasn't all that complicated when he started out in the 1980s. "I could use what we call pocket litter, a driver's license and these kind of things, and that that would be enough if I was ever questioned at a hotel or even when crossing borders," Sipher said. It's not that way any more. "There's no doubt it's much harder to build and protect cover nowadays than it was 20, 30, 40 years ago," Sipher added. Many airports scan faces and fingerprints and can check them against a vast database. Sipher says it could be tough today to enter the same country twice with different sets of documents. "With social media and a lot of these open source means of looking into people's backgrounds, if you don't have a consistent background, it's going to be much more difficult to hide your true affiliation," he said. Most everyone leaves digital footprints from a young age that easily can be checked years later — school records, work history, phone numbers, addresses. This is a dilemma for spies, who need online personas — real or fictional — that look plausible without giving away too much. The CIA's chief of recruiting, Sheronda (we're only allowed to use her first name), said that "People here do use social media, and yes, specific guidelines are provided." If a name was searched and nothing turned up online, that would raise suspicions. "I think everybody has some sort of online presence," said Mary, a CIA undercover officer who has spent most of her career abroad. "If you were to Google an officer, I'm sure something would come up, whether it was a college degree or whatever. So I don't think nothing would come up." Haspel didn't name any countries where she would like more officers. It's easy to draw up a list — Russia, China, Iran and North Korea. It's much harder to actually send officers. The latter two countries pose particularly daunting challenges since the U.S. doesn't have an embassy in either Iran or North Korea, and few American private citizens live there. Some in the intelligence world say it may now make more sense for some spies to use their real names and keep their real personal data, rather than create a fictional past. This past spring, two Russians were accused of poisoning a former Russian intelligence officer, Sergei Skripal, and his daughter in Britain. Britain reviewed security camera footage and later released photos documenting the visit by the suspects. "The British were able to put together an incredible mosaic," Sipher said. A private research group, Bellingcat, then used open source Internet data to tease out the real identities of the men, tracing them back to their hometowns in Russia. "They were able to put together essentially everything that they did to prove that it was a Russian intelligence operation," Sipher added. Intelligence work is often a combination of electronic surveillance and clandestine, person-to-person contacts. As technology races ahead, electronic or signals intelligence keeps getting better. Old-fashioned spying, between a CIA officer and a foreign source, gets harder. But Mendez says you'll always need the human touch. "It's a job of human beings," she said. "You have to find the people who have the access and then you have to do what I think is one of the toughest jobs in the world. You have to convince them to give you that information."